Sixth-gen Camaro gets a nip and tuck for 2019. General Motors just unveiled the which includes a reinvigorated front fascia, new technology, and an expansion of the Camaro 1LE family to now include the car’s entry level 2.0-liter turbo four-cylinder. 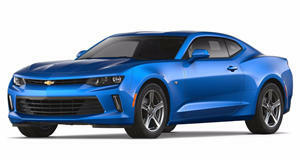 Chevy claims the Camaro’s updated design was as much about function as it was about form. The grille, fascia and hood surfacing were optimized for air flow, be it for reducing drag, or aiding cooling. The 2019 Camaro gets new front-end styling which brings distinct differences between LS, RS, and SS trims. The SS now gets a “flowtie” grille emblem along with aero-enhancing air curtains, specific headlamps, new LED signature headlamps, an extractor-style hood, a reworked rear end, and SS-specific 20-inch wheels. All SS models will feature launch control and line lock, with those who opt for an automatic transmission being treated to GM’s 10-speed automatic transmission already on offer in the ZL1. The RS Appearance Package brings a polished black grille with Galvano Chrome lower inserts, it’s own LED headlamps, plus a unique rear fascia, and RS-exclusive 20-inch wheels. Both SS and RS models get a different diffuser when equipped with the dual mode exhaust option. All models will get a new set of sculpted LED taillamps, while RS, SS, and ZL1 versions will get dark-tinted neutral-density lenses. The star of the show, however, is the new Camaro 1LE Turbo which adds another track ready option to the Camaro’s repertoire of 1LE’d versions of the RS, SS, and ZL1. Like its siblings, the Turbo 1LE comes exclusively with a six-speed manual transmission and a tailored chassis package borrowed from the V6 1LE to offer track-capable performance, it includes: larger diameter front and rear stabilizer bars, specifically tuned suspension dampers, stiffer rear cradle bushings, and cross-axis ball joints in the rear toe links that enhance lateral stiffness. Additionally, there will be a Drive Mode Selector with Sport, Track, and Competition modes, plus performance instrument readouts, and shift lights. It will ride on summer-only P245/40R20 front and P275/35R20 rear tires, while a new set of Brembo brakes with low-metallic pads will help arrest progress. The 2.0L turbo is good for 275 hp and 295 lb-ft of torque which should be more than enough when paired with the nearly 50/50 weight distribution offered by the chassis. Inside it will get the 1LE’s signature suede flat-bottom steering wheel and shift knob, along with available Recaro sport buckets. In terms of tech, Chevrolet’s next-generation infotainment system will feature. It mimics the latest smartphones and tablets, with cloud connection, personalization options, navigation, voice recognition, and a new suite of apps. The new system also adds OTA updates. The standard system brings a 7-inch-diagonal color touchscreen, with an optional 8-inch unit including navigation and the new infotainment system. Additionally, 2SS and ZL1 models will gain a standard rear camera mirror.